Usually KANcycling presents routes in a particular recommended direction, with one starting and one ending point - and since Japanese drive (and cycle) on the left side of the street, it's normally best to go clockwise around coasts and counter-clockwise around lakes so you're on the scenery side, In most cases, KANcycling routes follow that advice. In this case, however, the prevailing winds blow from west to east, and they can be fierce (Omaezaki is famous throughout Japan as a windsurfing mecca). So for this route it might be best to break with tradition and go the way the wind blows, from west to east. This also has the advantage of enabling you to end up with the magnificent view of Fuji you saw on the opening page. However, I did this route from east to west to check out the headwinds, so most of my photos are taken facing the west... and rather than present the route in west to east format and have all the photos facing the wrong way, I decided to show the route as I originally cycled it, east to west, and recommend that you do it in reverse. 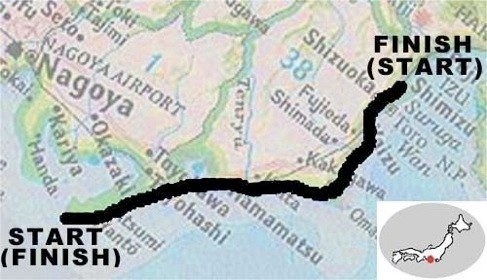 Also, although the route is titled Shizuoka, it actually ends (or starts) at the Miho Peninsula just south of Shimizu Station, east of Shizuoka, and it would be more convenient to make Shimizu the end point rather than backtracking to Shizuoka. If you catch an early morning ferry from Ise to Irago, you should have plenty of time to get to Hamamatsu before dark. You can then spend a day in Hamamatsu touring the lake at your leisure (going counterclockwise is fine here), or zip around the lake first thing in the morning and head off to Omaezaki for your second overnight. Due to the problems with signage that were mentioned on the opening page, cyclists are strongly advised to keep a close watch on time and just take regular roads if it becomes too difficult to find the next section of the bikepath... with one exception: DO NOT attempt to cycle through the tunnel on the Route 150 "bypass" (which you shouldn't be on anyway) between Hamamatsu and Omaezaki. This is one of the few tunnels in Japan that is off limits to cyclists and pedestrians, and for good reason: it's about three kilometers long and the footpath (designed for maintenance workers only) is extremely narrow; any deviation of more than two inches and you and your bike may fall half a meter onto a busy highway, right in the path of trucks roaring through. There is a bikepath that traverses this section anyway... so this is one case in which it would be worth taking the time to find that bikepath rather than be faced with the choice of going through this hellish tunnel (once again, take it from one who’s been there: you do NOT want to try this!) or backtracking to a safer road.